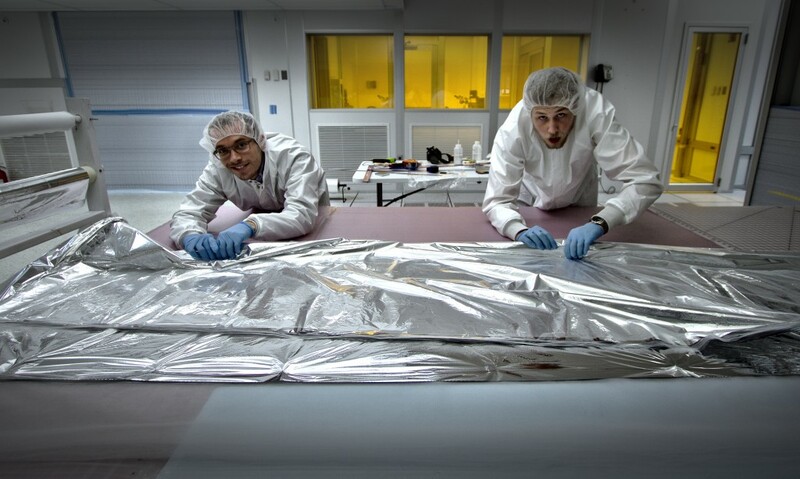 In recent weeks much progress has been made in making Multi-Layer Insulation (MLI) blankets for the HPF spectrograph. Below follows a video of some of the fabrication steps in the HPF clean-room lab: but what are MLI-blankets, how do they work, and why are they needed for the HPF? MLI blankets are blankets made out of multiple alternating thin sheets of a highly reflective material – in our case we use 6 micron aluminized Mylar (looks a lot like aluminum foil but more durable) – and a netted spacer material – Tulle in our case which is, yes, commonly used to make bridal veils. MLI primarily reduces heat loss by thermal radiation, but is ineffective at reducing thermal losses by heat conduction and convection. They are therefore widely used as thermal control elements for vacuum applications where radiation losses dominate. Satellites are a great example: MLI gives them the characteristic appearance of being covered with aluminum, or sometimes gold foil. The main idea behind MLI blankets is the principle of radiation balance and the Stefan-Boltzmann law. Ideally, the perfectly insulating blanket would be a blanket that reflects 100% of the incident radiation. It is, however, very hard to fabricate a single-sheet blanket that accomplishes this, but by stacking many highly reflective layers on top of each other we can achieve higher and higher reflectivity, and reduce radiation losses further. The individual reflective layers can’t touch, as then they would transfer heat between them resulting in no added insulation benefit (that is, we short-circuit the heat transfer); we need a spacer material to space them apart. A netted plastic material such as tulle (bridal veil) is great for this purpose. It is very thin and light allowing for very easy handling of the overall multi-layered blanket. Why do we need them for HPF? HPF is an infrared spectrograph which will operate at cryogenic temperatures of 180K, cooled with liquid nitrogen.These low temperatures are needed so we don’t saturate the infrared detector with background radiation. 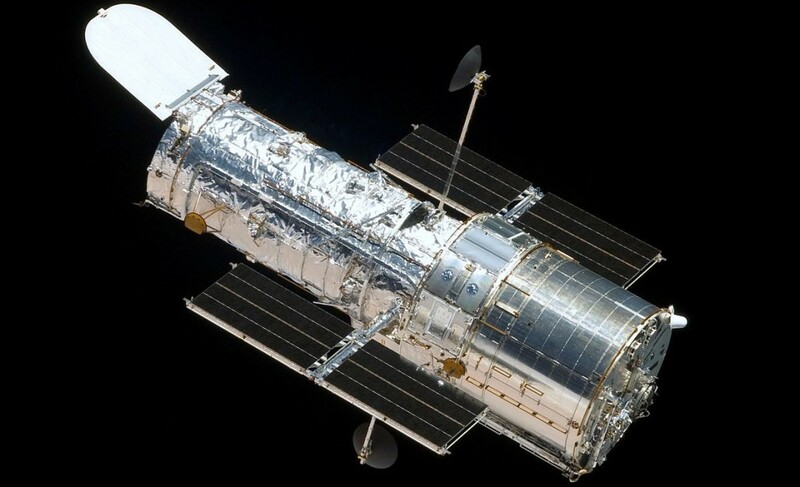 Moreover, the spectrograph operates under vacuum so radiative thermal losses will dominate, which makes MLI a great choice for thermal insulation. MLI blanket making – The blankets are assembled in a clean room to reduce particulates, which are unfavorable for vacuum pump-down. Traditionally, MLI blankets are sewn together; the multi-layered blanket being held together by stitches. However, any kind of hole that punches through the layers tends to degrade the overall thermal performance of the blanket. Another method, of using tag-pins – the small nylon “I” looking pins that are used to hook price tags to clothes in stores – to fix the layers in place, has been mentioned in the literature, see this paper by R. Hatakenaka. That way you don’t need to punch as many holes as when you are sewing, and tagging – a few inches between tags – is faster and less error-prone than sewing around the whole perimeter of the blanket. Moreover, the tag-pins allow you to fasten the layers together without compressing them, which reduces stress around the holes. Lastly, the blankets tend to contract in the direction of sewing, which might lead them to be too small if not over-sized properly. The blankets need to be properly sized, aligned, and held together to cover the whole radiation shield, liquid nitrogen tank, and copper thermal straps. Strategically placed Velcro-pads are used to align and hold the blankets in place on the instrument. We sew the Velcro onto the blankets to strongly fix them to the blankets. This results in more holes punched on the area of the Velcro than the tag-only method, but sewing fixes them better to the blankets. See the video at the top of this post for all the details on how we put everything together! Good morning, I’d like to ask you a question. Could you tell me the model of the sewing machine that you use to sew the velcro in the MLI blankets?